WHO: Residents / Commuters in the City of Monrovia. WHAT: This Thursday, the intersection of California Ave and Duarte Rd will be fully closed to thru-traffic to allow crews to reconfigure the traffic lanes and re-stripe the road for continuing grade crossing construction in the area. 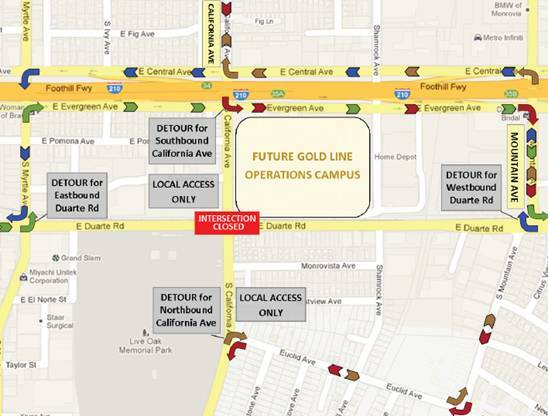 WHEN: Thursday, November 7, 2013 from 7:00 a.m. to 7:00 p.m., weather permitting: Intersection of California Ave and Duarte Rd will be closed to thru-traffic . WHERE: Intersection of California Ave and Duarte Rd in the City of Monrovia. – During the closure of the intersection, detour routes will be in place and signage will be posted to direct motorists. – Following the closure, Duarte Rd will re-open to one lane of traffic in each direction and California Ave will remain closed north of Duarte Rd. - Motorists are advised to expect delays. – Surrounding businesses will remain open and accessible during the closure. Construction schedules are subject to change for various reasons, including, but not limited to, weather conditions and unforeseen delays. About the Construction Authority: The Construction Authority is an independent transportation planning and construction agency created in 1998 by the California State Legislature. Its purpose is to extend the Metro Gold Line light rail line from Union Station to Montclair, along the foothills of the San Gabriel Valley. The Construction Authority built the initial segment from Union Station to Pasadena and is underway on the Gold Line Foothill Extension. The Foothill Extension is a $1.7 billion extension that will connect Pasadena to Montclair in two construction segments – Pasadena to Azusa and Azusa to Montclair. The 11.5-mile Pasadena to Azusa segment is fully funded by Measure R and will be completed in September 2015, when it will be turned over to Metro for testing and pre-revenue service. Metro will determine when the line will open for passenger service. Three design-build contracts, totaling more than $500 million, will be overseen by the Construction Authority to complete the Pasadena to Azusa segment. The Azusa to Montclair segment is environmentally cleared and is proceeding to advanced conceptual engineering. Has the Metro Gold Line Foothill Construction Authority given up on building to Ontario Airport (Fontana…Redlands…Moreno Valley…) already?